Years ago Starbucks gave out cards featuring a recipe for banana bread similar to the one sold in the shop. 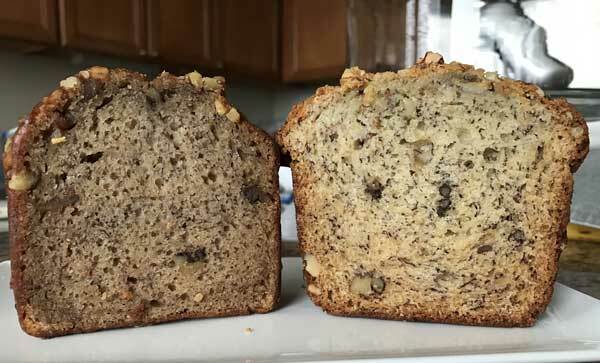 It’s made its rounds on the Internet and is known as “Starbucks Banana Bread Copycat”, but how close is it to the original? That’s what I wanted to know, so I bought a slice of Starbucks banana bread and did some comparisons. 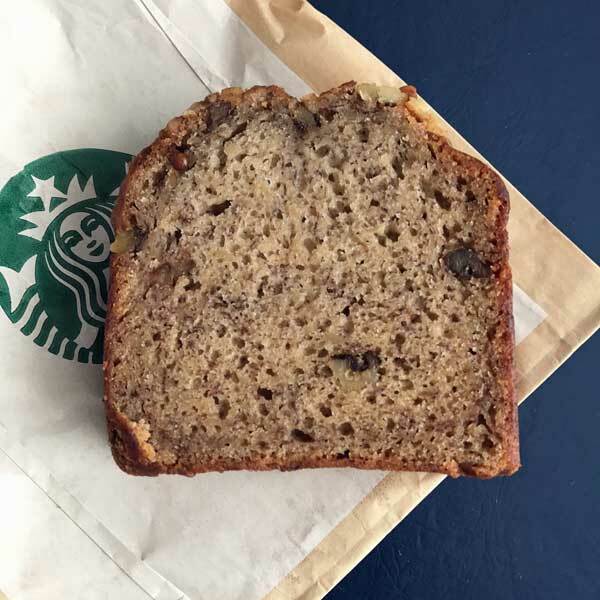 The photo below is of a slice of banana bread I purchased at Starbucks. And here’s a photo of the real Starbucks banana bread next to a slice of the copycat. Pretty close! Or at least after a few changes. 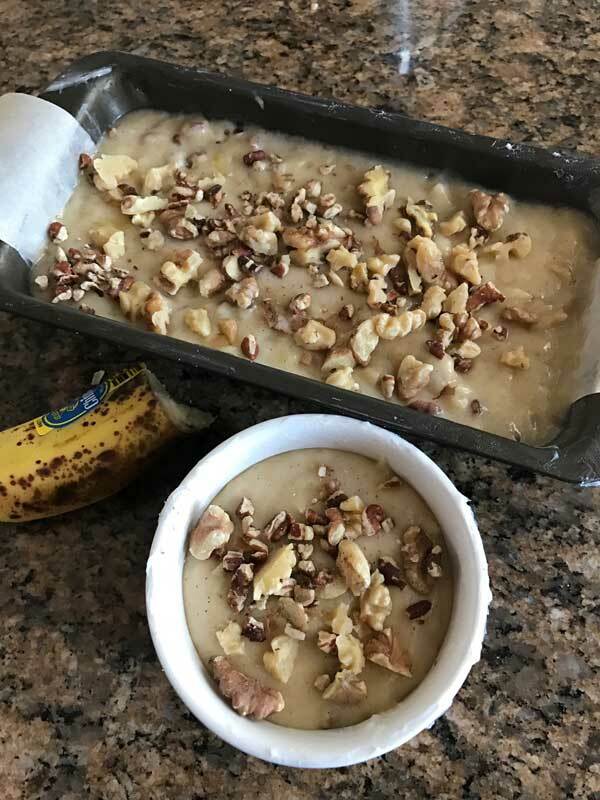 The first time I threw it together without much thought, used pureed bananas rather than hand-mashed (and probably one too many), and didn’t add any baking powder. I also used an 8 1/2 by 4 1/2 inch loaf pan. Oh, looks like I left off the nuts, too. Not so much of a copycat, eh? It actually tasted great, but I wouldn’t serve it at a party. Plus I wanted to get closer to the real thing, so I started by comparing the Starbucks website ingredient list to the copycat. The ingredients listed are similar, but the coffee shop version calls for baking powder and it does not call for milk. The coffee shop version also has a definite spice flavor — a hint of cinnamon maybe? Nutmeg? So I made the loaf again more carefully and with a few changes — I increased the salt, added a little baking powder in with the baking soda and threw in some spices. I also used the same size pan as Starbucks and mashed the bananas by hand. I kept the milk. 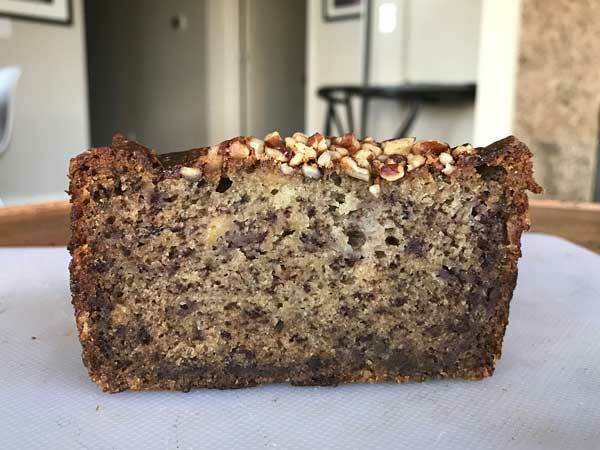 The Starbucks Copycat Banana Bread made a little too much batter to fit in the 8×4 inch pan, but that’s probably because most home cooks use slightly larger pans and whoever came up with the scaled down home cook version of the recipe took that into account. Overall I’d say the copycat version floating around is very, very similar to the real thing and might be one of my new favorites. And one last note — it freezes perfectly! In my opinion it’s even better after being frozen and thawed. 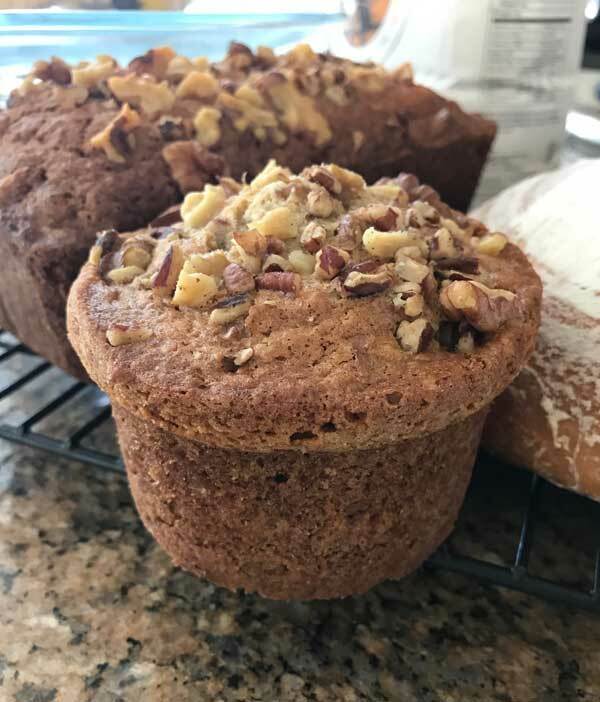 This is my twist on the original Starbucks Banana Bread Copycat. I use a little more salt, add baking powder and spices and bake in 4 cup capacity 8x4 inch loaf pan. Preheat oven to 325. Grease bottom and 1/2 inch up the sides of an 8x4 inch loaf pan and line with a strip of parchment. Also, grease a small 1 cup capacity custard cup for extra batter. Alternatively, skip this and use an 8 1/2 by 4 1/2 inch 6 cup capacity loaf pan. Put the flour, baking soda, baking powder, salt and spices in a bowl and whisk for a minute. In a mixing bowl, whisk the egg, sugar, and vegetable oil until smooth, then whisk in the vanilla and the milk. Mash the banana with a fork or potato masher (or your whisk! ), making sure you have 10 oz or 1 1/4 cups. Add to the batter and stir until blended. Add the flour mixture in 3 parts, stirring after each addition. Fold 1/2 cup of chopped walnuts. The batter should be fairly thick. Scrape batter into prepared loaf pan, but makes sure you leave room for it to climb up the sides. Try to keep it about an inch from the top. Put remaining batter in a custard cup. Draw a knife through it to release air bubbles. Sprinkle top with remaining nuts. Pour remaining batter into custard cup. Bake for about 65 minutes until a toothpick comes out clean. If using a larger loaf pan start checking at 45 minutes. The custard cup version should be done in 40. Loosen sides with a knife, but do not remove from pan. Let cool in pan for about 20 minutes, then remove from pan and let cool for several hours. Preferably, let cool then freeze and thaw. The bread has an even better texture after being frozen and thawed. If you don't have a scale, measure by spooning flour into the cup. You can also use the scoop and sweep method, but make sure to stir the flour well and aerate before measuring. If you have a scale, then just weight out the 250 grams. Yes, I just let it sit. Also, if you have a toaster oven you may want to just warm it at 350 or 400 for a few minutes rather than toast it. When you freeze and thaw the banana bread, do you just let it sit at room temperature to do that? I tried toasting it to thaw it and I found it got kind of dry, especially around the edges. Glad you liked it! If you get a chance, try the one called Best Ever Banana Bread. I can’t decide which I like best. 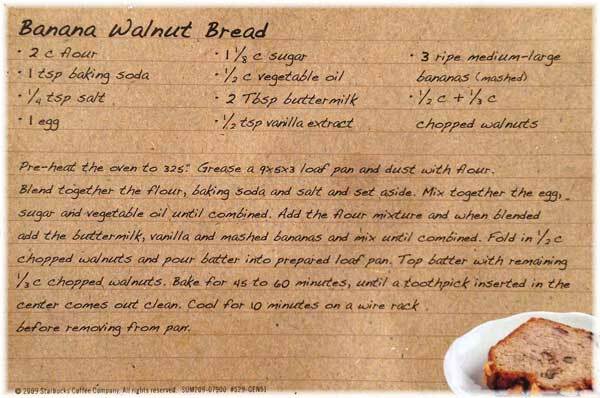 I have been making banana bread for as long as I can remember… and this recipe by far is the absolute best. 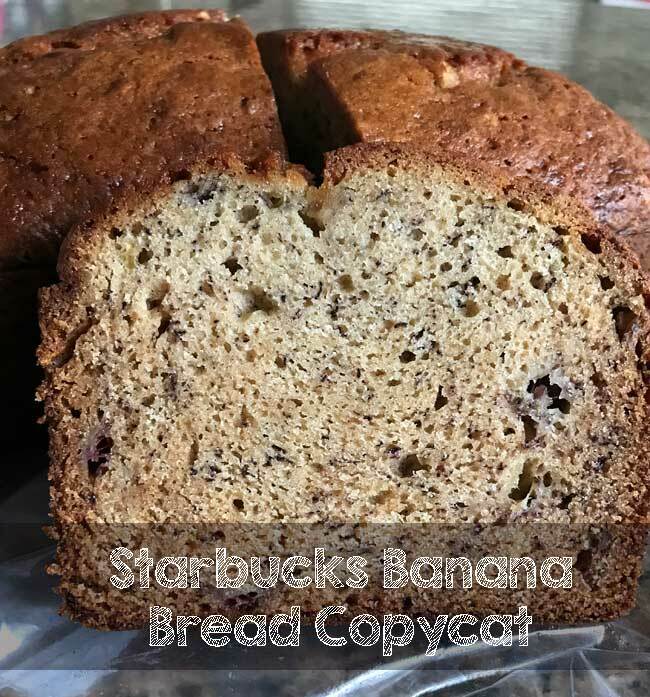 I came across this post when I searched for a copycat to the Starbucks banana bread my youngest son LOVED at the airport this past weekend, It is amazing… I made just as you instructed except I used 1 XL egg and I sprinkled Demerrara Sugar on top just before baking. Thank you!!! Perfection. I use a rubber scraper (spatula) or spoon. I rarely use my stand mixer for banana bread. Hi, do you use a stand up mixer or do you rather I corporate the ingredients using a spatula to avoid overworking the mixture? Thank you, it looks delicious! I replied to you via email! Hope you got the email. Anna I have gotten some really great recipes from your site .I have a secret recipe given from my grand its the BEST EVER 45 MINUTE YEAST BUNS THATS 45 minutes to bite into the softest bunsever if you would like this recipe let me know!! I did make a sling, but it’s not absolutely necessary. I’m always a little paranoid about getting things out of the pan, so I always make a sling. This is so cool! You nailed it! You’ll have to wait for them to ripen. Some people roast bananas. I tried that once but wasn’t impressed, so now I just wait around for them to turn brown. I might try to get my hands on some bananas to make this. M will be here me this weekend and she likes banana bread. Who doesn’t? No, it’s for after they are peeled. I put a measuring cup on the scale, set the tare to zero, filled it to about 1 1/4 cup with mashed bananas and got the weight. I’ll add “unpeeled” for clarification. Anna, is that 10 oz weight on the banana’s with the peels on? Thank you.